Outer Banks Productions offers wedding photography, photo booth & family portraits and are located in Nags Head, North Carolina. We serve the Outer Banks from Corova to Ocracoke. Douglas and Michelle Haber look forward to having the opportunity to work with you on your special day! Serving almost 800 Wedding Couples Since 2005! We provide the best customer service possible and quick reply times to emails and phone messages. Special pricing quotes are also replied to very quickly! 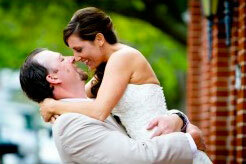 We offer pre-made packages and hourly rates to fit most budgets. We help keep everything on time and we work with your planner, DJ, and caterers to keep your event running as smoothly as possible! We offer free consultations throughout your planning process and offer documents to fill out so we know exactly what you want and need. We feel we are the hardest working husband and wife team available. Our reviews from other wedding couples will confirm this. You won’t see us standing around. We offer possibly the best editing of your images for color accuracy, exposure, contrast, and sharpness. We keep our sensors clean and do everything to provide images without dirty sensor spots. Additionally, we calibrate our monitors for color accuracy during the editing. We always shoot with two cameras each and keep backup equipment ready for any situation. We have a thorough contract that protects both the wedding couple and our company together. Our rates are very competitive and we are very flexible to work within most budgets while providing a great value. Douglas & Michelle Haber are two photography experts that have shot over 750 weddings and close to one million images since 2005. We shoot with a photojournalistic style and are known throughout the industry as two of the most thorough photographers on the Outer Banks. Just ask any vendors that we have worked with, and that’s close to all of them! We include images of your whole event including candids of your guests and all the detail shots that other photographers may not take. We shoot every wedding as if it’s for our own family! All of our packages include the high-resolution digital disk along with permission to make prints and online viewing for free! We include all the images we shoot, except any obvious duplicates and images that have not rendered properly. You will be very impressed! We include a generous mix of color and black and white images on your disk. Our additional products such as albums, prints, frames and other printable items are all guaranteed and come from one of the top professional labs in the country. Shipping is fast and accurate. We take all of your requests and are very fun to work with! Occasionally we offer specials that are significant savings. Please see our specials page for details and great savings! 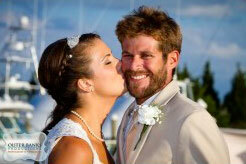 Outer Banks Productions owners Douglas and Michelle Haber are our two primary professionals. Michelle and Douglas are our primary photographers. Additionally, we often have our specially trained interns shoot alongside at our events. We never substitute who we promise to show up at your event unless there is an extreme emergency which has only happened once due to a premature birth of our son, many years ago. In any case, we are well connected and part of a backup group of local professionals. So you have nothing to worry about. *Our videography services have ended for the 2018 season. We are currently trying to remove banners and advertising that reflects videography. Please feel free to contact us for other preferred vendors! Douglas & Michelle consider our company unique because of our awesome customer service, fun attitude and attention to details. We strive to be the best in all of these categories and are constantly looking for ways to improve. There are a lot of photographers in the Outer Banks area. Some have been here for a long time, some are new like we were in 2005, but none of them offer our specific uniqueness and style. Our attention to details is our specialty and our editing style is number one on the beach! We look forward to showing you our uniqueness and working with you on your special day! You will find our wedding photography and photo booth rates are very competitive with the other professionals on the Outer Banks. We encourage you to speak with other photographers and photo booth professionals and then speak with us. You will need to contact us for any rates that are not on our packages page. We travel the whole Outer Banks North from the 4×4 area beaches, Carova Beach, Corolla, Duck, Southern Shores, Kitty Hawk, Colington, Kill Devil Hills, Nags Head, Roanoke Island, Manteo, Wanchese, Hatteras Island, Rodanthe, Waves, Salvo, Avon, Buxton, Frisco, Hatteras and Ocracoke Island. Some travel charges may apply. Sometimes we offer free mileage so just ask. We are also available for local, national and international events. Always nice to receive an email like this, from one of our clients!!! Hi Michelle, Thanks for sending the disk. The girl that helped me order the pictures worked in a photography studio for several years. She was very complimentary of your work , especially the element of light with beach pictures. She says that’s hard to get right. We are so excited to work with Marley and Kurt.We will be working with this amazing couple for their wedding in September of 2019. We love it when we get the chance tot shoot engagement sessions because we love to get to know our couples before the big day. We met Marley and Kurt at the Coquina Beach access in Nags Head, NC for their amazing engagement session. They are such a romantic and fun couple. We started the session in the dune line getting some amazing photos with the sea oats and then worked our way to the ocean. We had a little time and sunset left so we went over to the Bodie Island Lighthouse to finish off our session. Marley and Kurt picked the Outer Banks for their wedding because Kurt and his family have come here every year for his entire life. 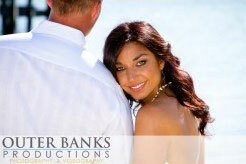 They will have a beautiful fall wedding at Jennette’s Pier. Their colors will be peach, pinks and sea foam. Reminds me of a sunrise over the ocean or a sunset over the sound.